I started in my little apartment sewing these jeans that, in hindsight, were really terrible. Somehow I was encouraged that I could make anything at all and within about 4 months I was making some wearable stuff. I really had no idea what I was doing, but would put in tons of time either sewing or talking to people or reading about sewing machines. I’ve had a few professions and one still is metal fabrication. I think it helped me to be able to think. 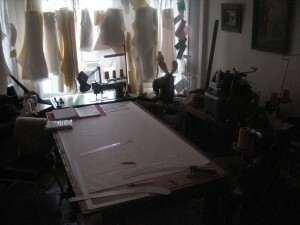 I would close my eyes and work out a lot of sewing problems by thinking it through. So I just kept at it and I’m telling you, the highs were high and the lows were low. About 9 months in I met a really key person that, I felt, took me under her wing. Then she and her friends taught me about denim. Up till then I didn’t know anything about denim. I was just trying to learn how to sew. This led to meeting a string of really smart people who seemed to be the gatekeepers of a lost art. Its funny to say the making jeans is a lost art, but it sort of is. Also, I started getting into the old machinery under certain peoples influence. This just made it even more fun for me. 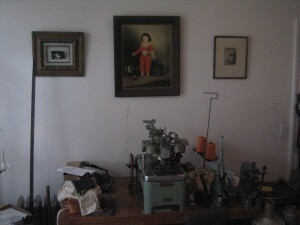 I already like old stuff, but old sewing machines have so much soul. At some point the apartment just became overwhelmingly packed with machines and my neighbors weren’t that stoked. I found a great space for my studio and started getting even more machines. This started another phase because with all that I’d been learning, my stuff was getting better. I was trying new things – jackets, shirts, skirts. 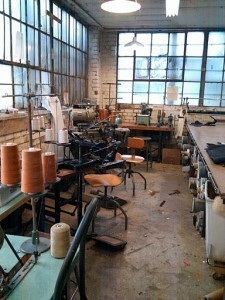 And, the whole time I’d been working on men’s and women’s jeans by doing custom jeans to force my self to learn. Every pair was like designing a piece in a line. At some point I had to say no more to custom and focus on what I really want to be making. From there I narrowed in on one style that I liked and was willing to sell. I put up a website with pictures of my shop and a page to buy the one style to test the waters and see what the response would be. To my surprise, and due in no small part to the nature of modern communications, orders started rolling in. As an experiment it was valuable, but it also opened a porthole to another kind of work and, consequently, life for me. As I saw the close of that test, I took all the lessons and worked out how I, as a lone worker, could produce lots of my jeans and effectively sell them and develop new styles and still keep it fun. This is where I am at now. Honestly, I’m still experimenting.